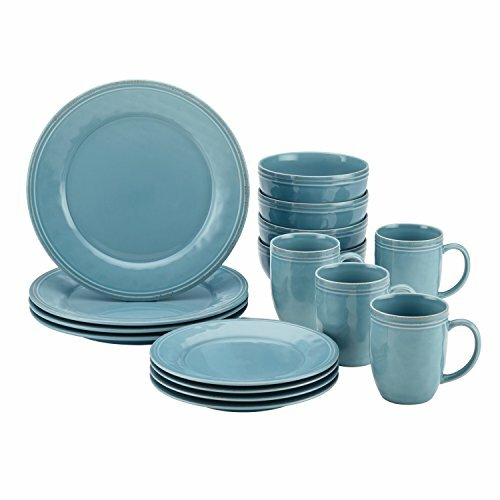 Experience the warm, welcoming appeal of the Rachael Ray Cucina Dinnerware 16-Piece Stoneware Dinnerware Set. As ideal for serving meals in cozy kitchens as for festive family get-togethers, the dishes blend relaxed, rustic character with modern functionality. Crafted from durable, solid stoneware and glazed with earthy, warm color, the dinnerware brandishes a touch of handcrafted texture and an antiqued look. Pair the stylish dinner plates, salad plates, cereal bowls and mugs with coordinating pasta bowls and appetizer plates or mix and match them with serve ware, pantry ware, and even oven-to-table cookware from the full Cucina collection for a great-looking, easy-going table. Oven safe up to 250 DegreeF for 30 minutes to warm foods, the stoneware dishes are also conveniently microwave, freezer and dishwasher safe. Bring family and friends to the table with delicious meals and beverages served with the cozy, inviting Rachael Ray Cucina Dinnerware 16-Piece Stoneware Dinnerware Set.